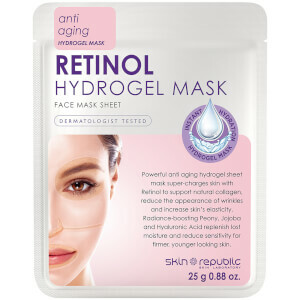 Supercharge your skin with the Skin Republic Retinol Hydrogel Face Sheet Mask, an anti-ageing sheet mask infused with Retinol to help support natural collagen. Promoting smoother, firmer-looking skin, the hydrogel face mask adheres like a second skin, aiding optimum delivery of ingredients for maximum efficacy. Powerful Retinol supports natural collagen to help reduce the appearance of fine lines and wrinkles, while radiance-enhancing Peony inspires a youthful glow. Helping to replenish lost moisture and enhance elasticity, it also contains Jojoba and Hyaluronic Acid. After use, skin feels hydrated and firmer.